Result: 2nd place Novice. Picture taken by Dave White. This feels quite strange, writing about myself on someone elses website is not something I am used to at all. My name is Lea Spencer, and I have the Redsurfbus (website and van!). Over the past 12 months I have developed my website from a small 'diary' type blog into something similar to this, with the intention of working together with Erik, Patrick and anyone else who would care to help. Last week I finished my first speed competition and came 2nd in the novice ranks, the write up is here. In my day job I teach mathematics to 11-16year olds but currently I am off work due to having blood that likes to clot. This caused a heart attack back in Feb'10 and multiple pulmonary emboli (lungs full of blood clots) in Aug'11. There is a lot more information here - '1000nmi Challenge'. The original illness along with inspiration from a windsurfing friend made me decide to raise money for the British Heart Foundation this year and windsurf 1000nautical miles. At about the same time that I was setting it all up (apx 1 year ago) I was invited to join the Portland Pirates on the GPS Team Challenge. 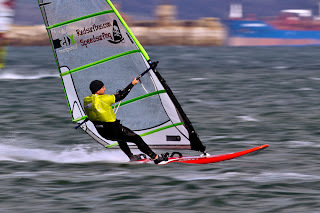 Not because of my skills as a windsurfer/speedsurfer more through my commitment to get on the water in any wind. My windsurfing is at intermediate level, but perhaps I am being hard on myself there as I can hold my own against a lot of other average ability windsurfers. In terms of speedsurfing I am a complete novice but I am very committed and willing to learn. I did my first uphaul about 6 years ago, with only a few sessions per year for the first 3, then the bug really bit and in the past 3 years I have been on the water about about 250times, sometimes for the whole day so my progress has been quite good recently. My PB's include a 35knot 2 sec, a 25.9knot NM, and a 201km distance session, all done this year and all hopefully broken by the end of this year. Now to the important part, and this is not about me, it is about all of you who read this. Our sport is growing, that can be seen by the increase in popularity of the GPS Team Challenge and the GPS-Speedsurfing.com rankings. Also you can see that the manufacturers are producing more dedicated speed/slalom kit, especially with all this new 'free-race' kit that is coming onto the market. This is comfortable kit for the weekend warrior to get some blistering speeds, to them and some of us 30knots is just as good as 45knots is to the top guys. What I want to do is report on it, from across the whole 'spectrum' of abilities. Every dedicated speedsurfer deserves some recognition for pushing their personal limits each and (nearly) every session. Being new to the scene myself I remember what it was like very clearly to get that 30knot average, it would be nice if some of you could email us your memories of that and we will publish it. How did you learn? What inspired you, or how did you get the bug for the sport? Both on this website and mine we can publish these amazing stories and each one will inspire and help others to achieve their goals in the sport. I see this website as a lot more technical than mine, probably due to Eriks better abilities on the water and his dedication in sharing tips about how to do it. My website will report on great sessions, and general news from around the world. This is a small but growing community and I have no intention of copying other peoples work, I want to work with all of the established media and add a little of my eccentricity. I hope you enjoy reading the articles I will add to both this site and my own and wish you all good speeds and winds. Super initiative and keep up the good work! Thanks Tag, additionally thanks for all your hyperlinks a person set up personally, these people provide lots of visitors towards the websites.